Bearded Theory is a festival I've been attending for a few years now and it just keeps getting better, and is always a highlight of the summer for me. This year's event fell on a bank holiday weekend which had the big bonus of not needing to book a day off work on the Monday for the journey home. On arrival things were looking good from the start - there were delays getting into the car park last year, but this year the parking has been moved and was better organised, so people were getting into the site far quicker. The Thursday evening is a nice gentle start to the festival - the main stage isn't open and half the arena is closed off, and there are just three bands on in the evening for people to enjoy after they've got their tents pitched and start to relax. The bands this year were on the new Maui Waui tent - easily spotted since it had a giant inflatable octopus on the roof. Inside was the nicest stage I've seen at any festival - not the usual black boards, this was painted as black and white tiles and was glossy. Couple that with the painted backdrop and it was a very impressive setup. The first act of the night was Jemma Johnson, a young singer-songwriter who has been proving very popular on youtube. She sings and plays acoustic guitat and has a lovely voice. Definitely a good start to the evening. Next up were Dr & the medics. They're a band I've never managed to see live, but I'd heard plenty of good reports so was looking forward to them. When the first thing you see on stage is an inflatable dalek, you know it's going to be a fun night, but that was barely the start of it. 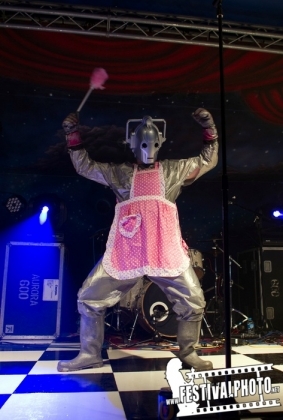 As the intro tape blasted out, one of the crew came on stage in a cyberman outfit (complete with feather duster), followed by the rest of the band. Over the course of the set, the cyberman changed into several different outfits to add a bit of extra fun or silliness to the show. What can I say about Dr & the medics except they are one of the most fun bands around. They played covers of a string of pop hits including "Kids in America", "Love shack", along with rock songs such as "Proud Mary" and "She sells sanctuary". To end the set, it had to be the song that made them famous - their cover of "Spirit in the sky". For an encore they picked two songs that had the whole place dancing - "Teenage kicks" and "Ace of spades". A superb fun set. 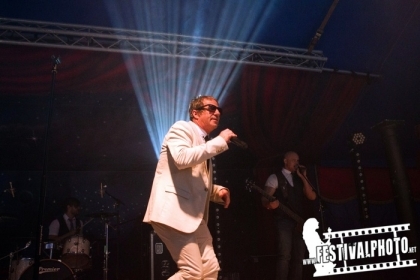 A band like Dr & the medics are a hard act to follow, but Dub Pistols are one of the bands that are good enough to do it. Two years ago when they were last at Bearded Theory they were on the main stage, so it's not surprising that the tent was absolutely packed out tonight for their set with plenty more fans outside listening to it. They're one of those bands that blends genres - ska, reggae, dub and more, and the resulting sound is one that is perfect for a party night like tonight. A great end to the first evening of this year's Bearded Theory.